This is massively cheeky, but if you don’t ask you don’t get (as Del Boy probably said to Rodney at some point). So, I’m going to ask. 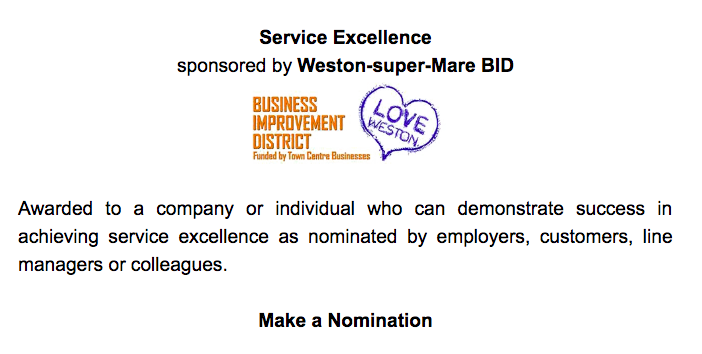 We at The Stable would love to win a Business Award from Weston-super-Mare’s Chamber of Commerce for the work that The Stable and its staff have put in to help stimulate Weston’s creative, tech and digital people and businesses this year. To do this, we have to get nominated first, which is where you come in. Nominating us will help us raise awareness of The Stable, Weston’s creative hub and coworking space. It could help us increase membership and the numbers of local people who get to enjoy all the fab and mainly free things that happen here. We’re an independent and non-profit focused Community Interest Company (a CIC) whose aims are to help prod Weston’s digital, tech and creative economies and to add to efforts to kickstart town centre regeneration over here in Grove Village. So whether you nominate us, vote for us if we get through or leave us a review (see below), this will all help us achieve our goals. Nominate us here and thanks loads in advance. For more info on relevant categories, read on. Google and its Digital Marketing experts for its Digital Garage workshops, attended by over 100 people. Founded the Weston Creatives and Weston Tech Meetup groups. These communities have 250+ members online, with 50+ attending the gatherings. Women’s Tech Hub has based networking group Girl Geek Dinners at The Stable to encourage women returners to begin tech careers or to skill themselves up further. Bristol’s TechSpark has hosted events at The Stable and is aware of the growing presence of tech activity in Weston, the outskirts of the traditional Bristol cluster. SpaceHive has run crowdfunding workshops at The Stable, helping locals learn skills to successfully raise money for local community events and projects. The West of England Growth Hub ran a Business Accelerator Pop-Up event at The Stable, with expert advice on finances, tax, crowdfunding and business support. Staff from the West of England Growth Hub have been available at The Stable for 1-2-1 drop-ins with businesses interested in funding or training for growth. Business West have run a series of open breakfast meetings at The Stable. The North Somerset Enterprise Agency’s #Bossit event has run at The Stable to give people skills to run their own businesses. Weston Chamber, Barclays Bank, the BNI networking group, Weston’s Ladies who Latte, Enterprise Nation, #SheMeansBusiness and others have used The Stable for networking groups and to give free skills-based presentations for locals. UWE placed four students at The Stable for several months to interact with the businesses based here while creating a heritage and planning guide for Weston. 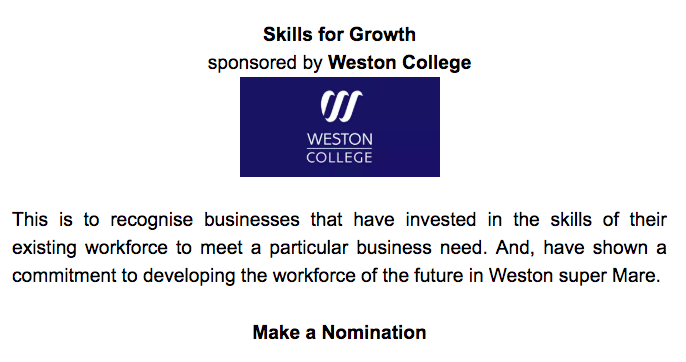 If you’ve benefited from any of the above, know someone who has, or have noticed how hard The Stable has worked to make things like this happen, why not nominate us in the Skills for Growth category at the Weston Chamber Business Awards. Nominate us in the Service Excellence category. Staff at The Stable do things for the love of it rather than because it’s in our job descriptions. If it benefits Grove Village or Weston in general, we try our best to help it happen. As a result, we have a (gratifyingly) good Review status online, often for our staff as well as for ‘the facility’ in general. Our Google Reviews (4.6/5) can be read online here, and our Facebook reviews (5/5) can be read online here. This makes us happy because we, namely Hub Coordinator Sam Brannigan and Hub Manager Kerry O’Neill, work super hard all the time both to get people in the door, and to help them once they’re through it. We often bring individuals together where we can see that our cross-sector knowledge will help different groups work together such as Weston's creatives and the Arts Council and Network for Creative Enterprise; local artists seeking a North Somerset Arts Week central Weston venue; and individuals and small companies seeking advice with funding and free training opportunities. We’ve also opened far earlier and stayed far later than we ‘need’ to, so that interesting events can run here. This includes breakfast meetings, weekend launches, skills events and craft fairs. The Stable has also hosted free or heavily discounted events such as for the Town Council’s Literary Festival, to allow latecomers to join the Festival programme although the Council's venue booking budget had already been exhausted. Not going to push this one any further because you’ve either received great service here and enjoyed the facility or you haven’t (and if you haven’t, do let us know in person or by sending us some constructive feedback so we can address it properly). If you have enjoyed your time here, why not nominate us in the Service Excellence category at the Chamber awards. You might want to review The Stable as a space/ building or for a training, social or networking event or Meetup you attended here. You might want to review our Coworking Loft if you trialled that, our coffee if you enjoyed a cup, our staff if they shone or our Rooms for Rent if you attended a meeting. To leave a Google Review, find us on the right-hand side of this page and leave your review or do likewise on our Facebook page. For constructive feedback on how we can improve, email us or get in touch so that can address your points properly, to help us learn and so that we can give everyone a better experience next time.